Stick-slip is a term used in science and engineering that refers to a phenomenon in which two surfaces stick until a force large enough causes the objects to slip a small distance past one another. University processes stick for a long time and then quickly slip a little. Because university processes stick for extended periods of time, it can appear as if no change is occurring. That’s because university committees typically meet on a monthly basis (stick) to carefully consider changes and also make changes (slip). Typically, committees meet only 8 or 9 times per year, and meetings stop on-time because faculty have to go and teach class. This limits the number and type of improvements that can be made. As I said in Lean University, committees should process smaller amounts of information more often, thereby increase the volume of work processed and improving flow (one of many useful improvement ideas in the book). Based on my 15 years of industry experience and current involvement with industry, processes in industry can be stick-slip as well. But more often, the process for improvement is a slow, creeping along such that the changes made are exceedingly small. 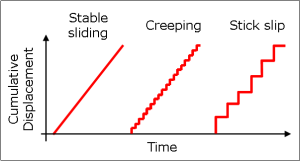 Creeping, as shown in the image above, is not “continuous improvement” because improvement proceeds so slowly as to be barely perceptible. The major changes that do occur typically relate to the use of new software, which is also stick-slip. Otherwise, change is difficult to detect. In this sense, universities and industry are more alike than people realize in terms of the pace at changes are made. Yet, industry does one thing well that universities do not do well. That is, they are forced by shareholders or customers to respond to major shocks in the marketplace or major management blunders. Legendary are the many stories of companies that faced extinction if they did not begin to offer new products and services, or the re-vamping of corporations due to fraud or mismanagement. When forced to change in significant ways, corporations generally change (but they often backslide as well). Few organizations continuously improve in ways that make meaningful differences day-to-day – called “stable sliding” in the above image. For that, you have to look at Toyota Motor Corporation, and, in particular, the unique way in which they practice kaizen. Kaizen is the core of their management system (click here, here, and here to learn more), and universities would be wise to adopt it and other elements that form the context in which it functions effectively. Stable sliding would be good for universities overall, though it would surely result in some problems. However, problems are more quickly recognized and corrected in stable sliding. The challenge is that stable sliding must be led by the people who are in leadership positions, starting with the president of the university, along with the provost, deans, and administrative staff leaders. To do that, leaders need to learn new things, some of which can be learned by reading. Click here, here, here, and here for key books on kaizen (read all four). But, to really know it, leaders have to put what they learned from books into daily practice.